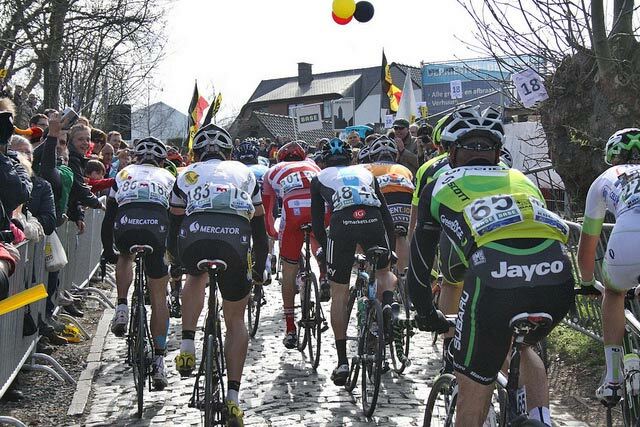 With an enforced lay off from cycling, I was looking forward to the 2015 edition of the Tour of Flanders quite a lot. It’s a great classic Belgian cobbled race – made even more interesting by the superb form of Geraint Thomas this year. His victory in the E3 Herelbecke was a really great race to watch. It’s great to see a loyal team-worker come of age in the big races. With confidence high – perhaps it was time for Team Sky to finally claim a ‘monument’. In the end it didn’t work out – emphasising how tough it is to win a monument. Thomas lacked the last 5% he needed to stay with the late breaks and there was a predictability in the tactics of Team Sky. The good thing about watching cycling on TV is that it is very easy to become an armchair critic – offering advice without even getting your heart rate over 60bpm. The 2011 World Championship victory where 9 GB riders dominated the peleton for the entire race to set up Mark Cavendish was completely unprecedented and one of the most remarkable team victories of the modern era. But, that kind of tactics is going to work very rarely – especially in hilly cobbled races. On the plus side, riding at the front keeps you out of trouble – you are less likely to have an accident (though Wiggins still managed to came a cropper, giving something to talk about in the long build up). But, when the weather is very good like yesterday, there seems to be a lot less accidents than usual. In the main peleton (as long as you were protected from service vehicles at the back) the Tour of Flanders seemed remarkably crash free by recent standards. Everyone else was very happy for Team Sky to burn up their matches before the really crucial last 40-30km. Alex Rowe did an outstanding ride and managed to hang on up to the last part. But, I would have liked to see Team Sky try something different, like let other teams ride on the front – try to send the odd riders up ahead (if Andre Greipel can attack at the base of a Belgian cobbled Hellingen, I’m sure Team Sky have a rider who could too. One of the crucial things about classics seems to be having riders left at the really critical part of the race. You can guarantee a team like Etiix will have 2-3 in the mix, giving more options. The problem is that by Sky always riding on the front, Thomas became the most marked man – and everyone was looking to Thomas and Sky to close down the gaps. True Thomas is in good form, but he was never an outstanding favourite like a Cancellara. If the weather had been strong – cross winds and rain – their strategy of sticking on the front may have been much more desirable. But, overall I think, Team Sky would benefit from a greater unpredictability and willingness to try different things. At 17km to go, Thomas made a big effort on the Kwaremont climb. But with Etiix Quick Step’s Stybar stuck on his back wheel, like a limpet it wasn’t enough. It was a big effort to no avail, and so it meant on the last climb of the Paterburg, Thomas lacked that couple of seconds to stick with the second chasing group of Sagan and Van Avermat. A more intelligent ride by Sky, and Thomas might have helped him make it into that 2nd chasing group, which would have been an intriguing chase. But, you get the impression – whatever the tactics, Kristoff was the strongest rider of the race, with Tepstra a deserved second. So there you go – an amateur time triallist, 4th cat road racer offering advice from the comfort of his armchair to one of the most successful pro cycling teams of this generation 🙂 – It’s always easier watching on TV. Paris Roubaix will be very interesting, with Sky having four really strong riders – Thomas, Rowe and Stannard and the mercurial Bradley Wiggins. You get the impression with Wiggins that he finds road racing a tough gig; you don’t see too many world champions / tour de France winners languishing at the back of a peleton on so many occasions. But, how can you criticise a cyclist who has the most eclectic and comprehensive palmeres in the modern cycling generation? They say when Wiggins puts his mind to it, it’s very difficult to stop him. He will be 100% motivated for Paris-Roubaix, and he really will be something of an unknown quantity. A Wiggins win would be a fairytale ending for one of most spectacular cycling careers. Can he do it? It’s a long-shot. Possibly, but I wouldn’t put my house on it. Wiggins can win – but so can several other riders; it’s going to be a real fitting climax to an epic classics seasons. But, secretly I would be just as happy if Thomas or Stannard won.